Apparently Sleeping Using Pillows Dangerous To Babies - Some people believe that using a U-shaped pillow for babies can help the baby's head is formed perfectly round. Be careful because this assumption is wrong. Until now there is no evidence about the benefits of pillows for babies. Instead, experts would advise parents not to use any pillow for babies until the age of two years. The shape of the newborn's head is not perfect because of the influence of the process of labor or birth aids (such as forceps). His head takes time to change into the ideal shape. Although the birth can affect the shape of the baby's head, there is really nothing to worry about. In most cases, the baby's head shape can be round as time passes. Therefore, no need to work around with a pillow that actually endangers the baby. If the pillow is torn, the contents of the pillow can come out. If a little pillow stuffing out, then into the baby's mouth or nose, making himself at risk of choking. SIDS is an unexplained death that usually occurs when the baby is asleep. Although the baby looks healthy, he or she may have SIDS. This phenomenon mainly occurs in infants less than one year. SIDS is also known as baby crib death because babies often die in their cribs. Although the cause is not known for certain. SIDS is associated with abnormalities in the baby's portion of the brain that controls breathing and awakens from sleep. 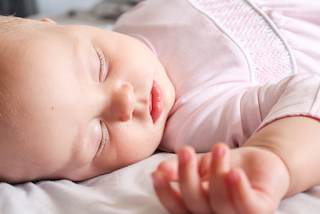 Other theories reveal that infants can have a higher risk of SIDS when sleeping on their stomachs, especially when the baby is sleeping on a soft mattress with a bedspread, with a stuffed toy, or even a pillow near his face. A theory suggests that the soft surface of the pillow or objects around it allow the creation of a small screen around the baby's mouth and trap the breath. As a result, the baby breathes in again the breath. Oxygen levels in the body will then decrease and carbon dioxide will accumulate. Finally, lack of oxygen can contribute to SIDS. Pillows may be used for babies to take a nap on the note that you are supervising. If you do not watch it, better keep the pillow away. If the baby is asleep with his pillow, slowly grab the pillow gently and place the baby in his basket. Choose a small, firm pillow with a soft sarong. It is advisable not to use cushions made of polyester material because polyester fabrics can cause irritation. Prioritize the cotton fabric. Check regularly if pillowcase is torn. When torn, remove the pillow. Clean the pillow regularly. Pillows can be a hotbed of germs, dust, sweat, remaining dry milk, or baby oil. Wash the pillow according to the care instructions and make sure it is completely dry before use. Do not feed your baby while he is lying on a pillow. Feed baby with a position like breastfeeding. Copyright © BabyGifa - Libra Yanada. All Rights Reserved.